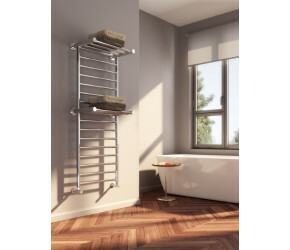 A perfect towel rail for a family bathroom. With two shelves incorporated into the design, along with the ladder style, there is plenty of room to dry multiple towels at one time. The Reina Adena is made from 304 grade polished stainless steel which is anti corrosive and rust resistant. It boasts a 25 year guarantee for peace of mind.